A fat is considered to be a vegetable fat if it comes from plant-based sources instead of originating from an animal. Most vegetable fats are healthy in that they come in the form of unsaturated fats, but some plant-based fats, such as trans fat, are unhealthy, and should be avoided as much as possible. Eating foods that contain healthy vegetable fats as a replacement for saturated fats and trans fats in your diet can help keep your heart healthy by improving your cholesterol. 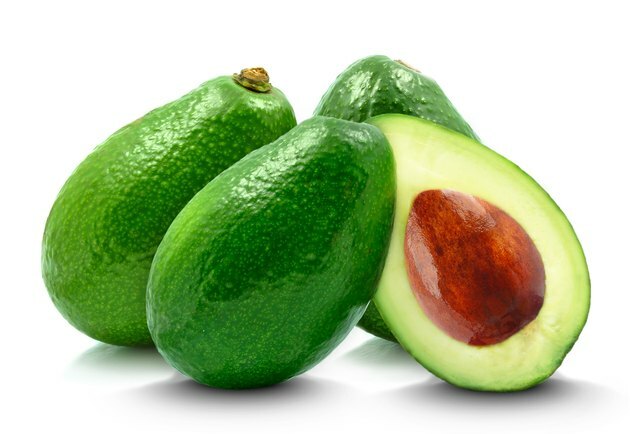 Avocados contain a significant amount of monounsaturated fat from vegetable fat at about 5 g per serving. According to the CDC's Fruits and Vegetables Matters website, an avocado will provide you with essential vitamins and minerals, such as vitamin B6, vitamin C, vitamin E, potassium, magnesium, folate, fiber, plant sterols and healthy fats. Avocados are commonly eaten in dips, but they can also be consumed in other ways such as added to sandwiches and salads. Olives provide a significant amount of vegetable fat, and are high in monounsaturated fats. When olives are pressed and used to make olive oil their high fat content is passed along. Olive oil is considered to be high in healthy fats and is often recommended as a part of a heart-healthy diet. The traditional Mediterranean diet, in particular, touts the use of olive oil to glean healthy unsaturated fats. People who consistently eat traditional Mediterranean diets experience lower rates of cardiovascular problems. Peanut butter made from the process of creaming peanuts contains a significant amount of plant-based fats. Peanut butter is considered a health food and is often used to provide undernourished people with a significant source of vitamins, minerals and fat. Peanut butter contains around 16 g of plant-based fat per serving. A significant portion of the fat comes in the form of unsaturated fat, but a small percentage is from saturated fat. Some types of peanut butter contain small amounts of trans fat. To avoid trans fats, look for more natural forms of peanut butter where the oil separates in the jar, or cream your own. Nuts and seeds in general contain noteworthy amounts of vegetable-based fats along with an abundance of other healthy nutrients. Some nuts and seeds, such as pistachios, contain more fat than others, but they all provide significant amounts of monounsaturated fats and polyunsaturated fats. Nuts and seeds are recommended by the American Heart Association as a healthy snack that can be eaten in moderation to help you reduce your levels of bad cholesterol. Vegetable shortenings are commonly used in baked goods. Vegetable shortening often contains high amounts of fat and many times the fat is unhealthy. Trans fat is often found in considerable amounts in vegetable shortening. Eating trans fat can have a greater negative impact on your blood cholesterol levels than eating high amounts of dietary cholesterol. Does a Cashew Nut Have Cholesterol?